Capture a genuine piece of extraterrestrial meteorite between two bands of the toughest substance on Earth. It came from outer space, screaming through the night sky, intent on crushing the inhabitants of earth. But it was not prepared for what it found when it crash landed. Instead of a meek people willing to do its bidding, the alien invader foundVikings. Arrows flew, heavy wooden shields were raised, and great clashes of metal sent sparks into the air. When it was over, the fierce Nordic warriors claimed victory over the invading force. 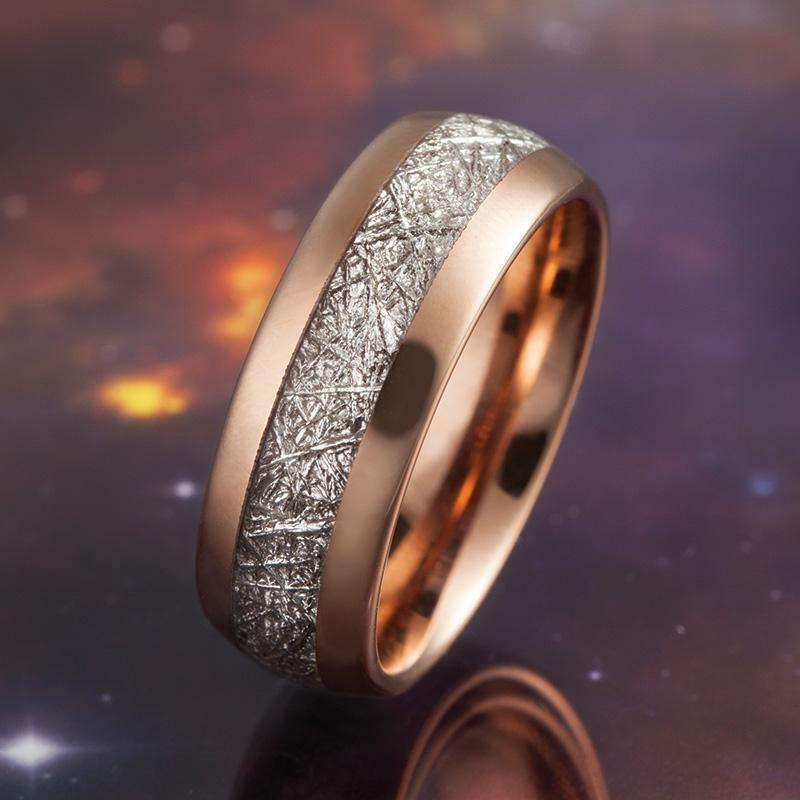 The Meteorite In Tungsten Ring contains a genuine piece of the Muonionalusta, a type IVA extraterrestrial meteorite that crashed millennia ago at the future site of a small Scandinavian village. The Muonionalusta fragment is visible in the central band of the ring and identifiable by its unique crisscross pattern. But don't worry, it's safely subdued, surrounded by two impenetrable walls of rose gold-finished tungsten, Swedish for "heavy stone," and one of the hardest substances on earth, representing the Vikings steadfast refusal to lose in battle. Despite its rarity, we've priced the Meteorite In Tungsten Ring at a price just as rare. Though this mini-monument to man's muscular victory over the first ever alien invasion represents our world's closest ever call with destruction, we decided that the Meteorite In Tungsten Ring didn't need to cost the earth. With an item as unique as this, it's not just about affordability, it's about who has the fighting spirit to wear it. Any man out there who can commit to containing this fragment of tungsten-encased Muonionalusta is invited to step forward and volunteer for duty.